Congratulations! Are you Registered to Vote? 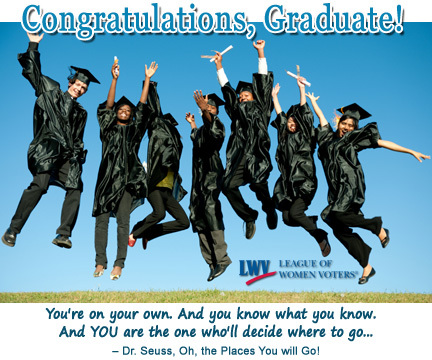 Share this e-card with the graduates you know and congratulate them on their achievement, and remind them to register to vote. “You have brains in your head. You have feet in your shoes. You can steer yourself any direction you choose. You're on your own. And you know what you know. And YOU are the one who'll decide where to go...” – Dr. Seuss, Oh, the Places You will Go! Congratulations – graduation is a major achievement! As you embark on new adventures, take a minute and register to vote or update your registration if you’ve moved since the last election. Registering is easy – just click on the image below, fill out the printable form, and send it to the address listed. In a few short months, we’ll be electing officials whose decisions will have an impact on you and me. The election is about so much more than the resident of the Oval Office, it’s about you – your job, your education opportunities, your community, your future. This is your chance to stand up for what you believe in, so please take a minute to register to vote! Congratulations again!